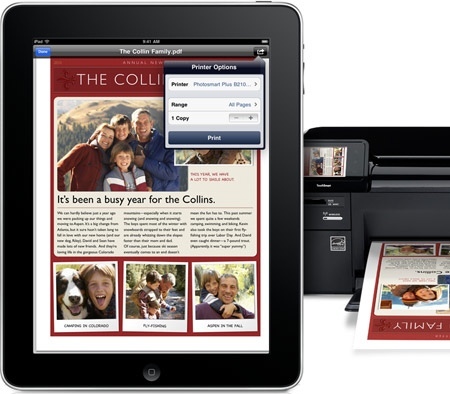 iOS 4.2 introduced many features including AirPrint which makes it easier to print directly from your iPad, iPhone or iPod touch. All you need to do is connect your iOS device to the same network as the AirPrint-enabled printer then choose print within the app. Many apps were updated to support AirPrint. I don’t think these models has arrived in the Saudi market until now. There will be more printers added to the list with time and there is a rumor that Apple will add AirPrint support for older printers. Did you find any of these printers in the Middle East? Is the HP Envy e-All-in-One Series (D410a) a mobile/portable wireless printer. I’d like to use this printer on the road. I may be traveling to Minnesota in Feburary to see my first granddaughter. I will be taking the Amtrak train. I’d like to be able to use it on the train and print pictures of all the stops and locations all along the way and show them to my son. Is this asking to much of a wireless printer to do? There is an app for the Mac that makes any printer connected to the computer an AirPrint ready..